Fanuc M-900 series designed for the handling of heavy loads, with a highly firm structure, the wrist motors are installed on the shoulder for greater protection in operations. high load capacity between 150 and 700 kg and an approximate arm reach of 3.7 m. He specializes in a wide range of applications of handling and force such as heavy workpieces, fast palletizing and precise drilling for heavy work. Providing great versatility, maximum savings in the workspace and faster cycle times. Variety of mounting options for greater flexibility. 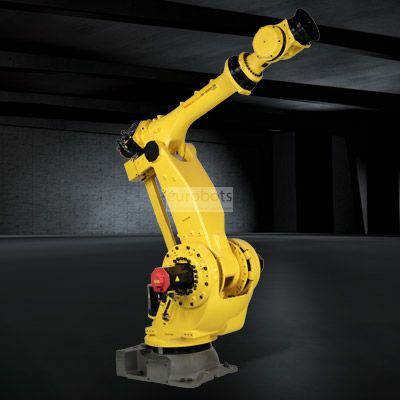 M-900iB / 360 industrial robot with compact design and 6-axis spacer that provides the required dexterity for fast and accurate handling, with heavy load handling capacity, optimization for fast cycle times and improved cooling, the light hollow doll that protects the engines from heat and hostile environments. suitable for assembly, welding and parts transfer applications.